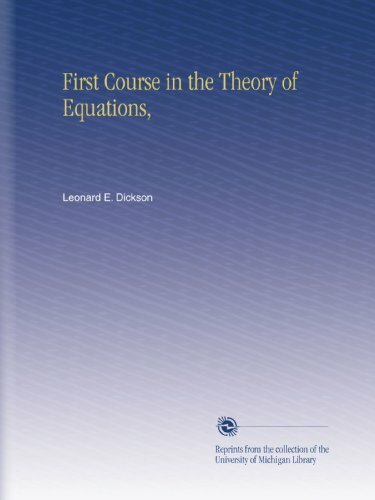 The theory of equations is not only a necessity in the subsequent mathematical courses and their applications, but furnishes an illuminating sequel to geometry, algebra and analytic geometry. Moreover, it develops anew and in greater detail various fundamental ideas of calculus for the simple, but important, case of polynomials. The theory of equations therefore affords a useful supplement to differential calculus whether taken subsequently or simultaneously. Contents: Introduction; Exponents; Surds; Error margins; Quadratic sequences; Finance; Solving quadratic equations; Solving quadratic inequalities; Solving simultaneous equations; Mathematical models; Quadratic functions and graphs; etc. This is a compendium of mathematical formulas, processes and tables plus applications in personal finance and other useful technical information that will well serve both students and teachers alike from early grades through early college. The book combines analytic geometry and topics traditionally treated in college algebra that depend upon geometric representation. Through this combination it becomes possible to show the student more directly the meaning of these subjects.